Posted in Desserts, on April 22nd, 2017. Oh my goodness, is this cake just off the charts. And it has a story (not mine – on food52). A couple of weeks ago I was reading a post at food52, and this carrot cake story was just so sweet. 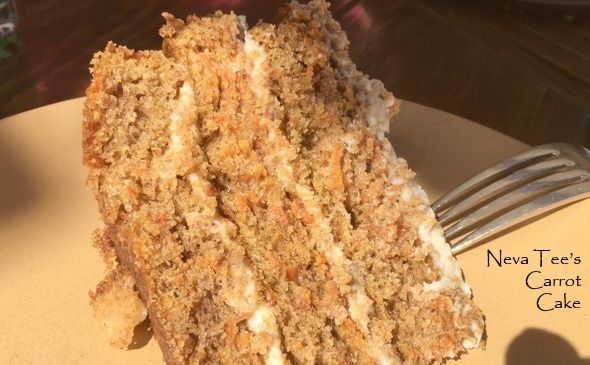 About Mary Catherine Tee’s grandmother “Mom Mom’s” 3-layer carrot cake. And how the grandchildren made the cake for her in her last days, when she was suffering from advanced Alzheimer’s, confined to a nursing home. And about the smile it brought to her face. 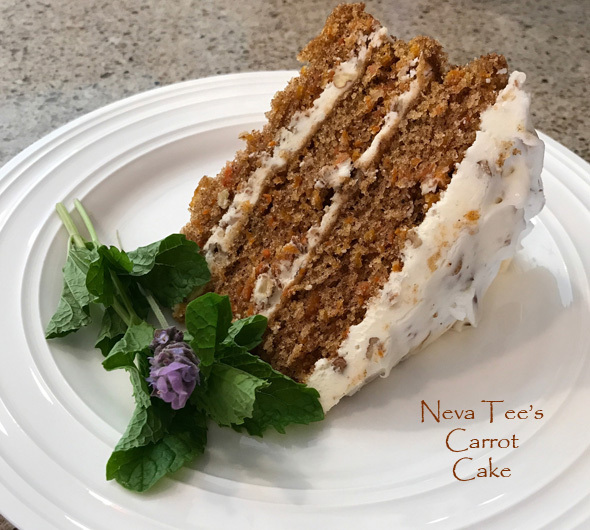 It was such an unusual story, I had to send the post to my friend Linda T (many recipes here on my blog are from her recipe files), who has been making a more traditional 9×13 carrot cake for decades. That recipe is here on my blog too. Hers had been my go-to recipe for as long as I’ve had it; at least 30 years. Until now. Until this cake. Recently, Linda, my friend Cherrie, another mutual friend Yvette and I met for lunch in Carlsbad. At a very hot new restaurant called Campfire. Quite a place – lots of grilled items, fabulous breads, sandwiches, unusual sauces or spreads on bread, or something different on most everything on the menu. It was close to Yvette’s birthday, and because Linda and I had talked a lot about this cake, she made it and brought it to the restaurant (they didn’t charge us for the use of extra plates). Carrot cake happens to be Yvette’s husband Joe’s favorite, Cherrie’s husband Bud’s favorite, and was my DH’s favorite as well. Linda let us split up the remaining cake between us, to take home. What a treat. The birthday girl in the photo at right with the cake in the shade in front of her. What’s different about this cake? It’s lighter in texture – MUCH lighter. Hard to believe since it contains so much shredded carrot, but it IS. It’s a more tender cake – I guess that’s what I mean when I say “lighter.” It still has some cream cheese in the frosting, but it’s not a thick frosting (that part I really liked). It uses pecans – but in the frosting. The ONLY thing I’d try next time, is to add some pineapple into the frosting. Crushed (canned) pineapple that had been squeezed completely dry and squeezed in paper towels too – so it wouldn’t dilute the frosting with any liquid. I haven’t tried this – so I can’t make any promises about it, but I think it would be a lovely enhancement to the cake. At least I’d try it. I’d use an 8-ounce can, drained well, then squeezed dry as mentioned. What’s GOOD: I think this cake is fantastic. Not that I make 3-layer cakes often – and I didn’t make this one, but since my friend Linda has now made it twice, and was planning to make it again the same week, I’d say it’s been truly tested well. Do read my notes about possibly adding crushed pineapple to the frosting. Linda did not frost the outside of the cake – it was supposed to be enough, but Linda just thought it would be better to leave the frosting off the sides. I’d definitely do it that way again too. What’s NOT: only that you have to make/bake 3 layers. Not hard, really. A bit time consuming. But, you’ll hear raves. I just know it. NOTE: Although not in the original recipe, I would try adding 8 ounces of canned crushed pineapple to the frosting. BUT, thoroughly drain the pineapple and blot dry with paper towels before adding to the frosting mixture. 1. Line 3 round 8-inch cake pans with parchment paper and heat the oven to 350*F.
2. Add sugar, oil, eggs, and 1 teaspoon vanilla to a bowl. Beat well. 3. In a separate bowl, combine the flour, baking soda, and cinnamon. Add slowly to the sugar/oil mixture, stirring to incorporate. Fold in the carrots. Divide among 3 prepared pans. 4. Bake for 30 minutes. Once cake passes the toothpick test, remove from oven and cool on wire racks. 5. For the filling/frosting, use an electric mixer to mix the confectioners’ sugar, butter, remaining 1 teaspoon vanilla, and cream cheese on medium-high speed until smooth. Turn off mixer. Add chopped pecans and mix on medium-low speed until nuts are incorporated. Refrain from eating all of it with a spoon. Spread between layers (may do sides too, though it will be a thin layer) and top of cake once the cake has cooled completely. 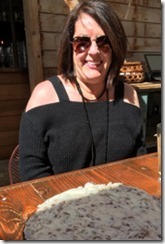 NOTES: My friend Linda doesn’t own 8-inch cake pans; only 9″ ones. She made this in the 9″ pans and it turned out just fine – probably a few minutes less baking time. Per Serving: 740 Calories; 41g Fat (49.0% calories from fat); 7g Protein; 90g Carbohydrate; 3g Dietary Fiber; 112mg Cholesterol; 538mg Sodium.